Did you enjoy Thanksgiving last month? Plenty of food and fellowship with your family? Did you go shopping on Black Friday or Cyber Monday for the killer deals? Are you crossing of things on your list, getting ready for the holidays? I'm starting to gather a few items for my family. Well, not everyone is as blessed as we are. Many people would not have had a Thanksgiving without the Salvation Army. Many will not have Christmas either without the help of people like you. I don’t know about you, but I really can’t do much but I do know that every little bit received contributes to a blessing in someone’s life. For Christmas, I decided to set up an online “Red Kettle”. I’m not asking for a lot from people, a small donation of $1 to $5 if you can, more if you would like. My donation is $5 which in the grand scheme of things is not a lot, but it’s what I have to give and when added to others it does make a difference. Below is my personal page. If you would like to give, thank you!! If you would like to start your own kettle and post it on your Facebook or email to friends, please do. Or if you would like to share my kettle page with friends that would be great. There’s no prize for who collects the most. The prize is helping others. 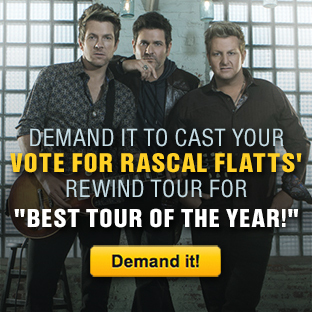 Demand Rascal Flatts "Best Tour Of The Year"
Be sure to Demand Rascal Flatts in your area today! Sending well wishes to Gary LeVox. 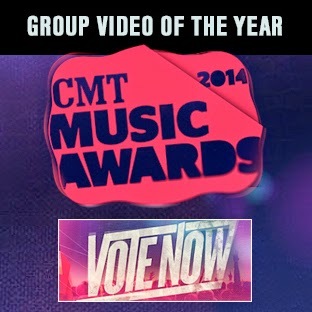 Rascal Flatts have been nominated for Group Video of the Year for #Rewind at the 2014 CMT Music Awards! This award is completely based on your votes. You can vote online once per category until June 2nd at 12:01PM ET.